It's definitely getting chilly outside and when that happens I'm ready for layers, scarves and fall boots. What I love about tunics is that I can wear them as dresses when the weather is warm, or pair them with leggings and boots once it gets colder. 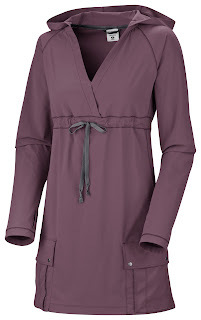 When I went to Columbia Sportswear's Fall 2010 preview, I was really surprised to see these comfortable, wearable tunics - I couldn't wait to try them out! It's nice to have a few casual tunics in my wardrobe. 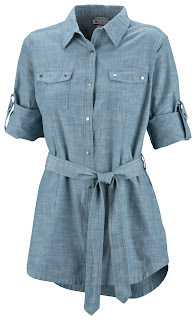 The chambray Towering Tour™ Tunic is just long enough for me to wear as a dress without being too short, but now that it's a little colder I plan on wearing them with black leggings and maybe a long, chunky sweater. It's super cute and has convertible sleeves, which I love! I thought the Explore Your Soul™ Tunic was going to be too long on me, but it is actually a great length, still falling above the knee. This is great to wear for hiking, running errands or walking around the city. It's really lightweight, has advanced evaporation technology and 4-way comfort stretch to keep you cool. This tunic also has Omni-Shade® UPF 50 sun protection and Omni-Shield® advanced repellency. Their XS fits me well, with a really slim fit. Columbia Sportswear is definitely on my shopping list for comfortable, sporty pieces.